Sometimes situations occur where stereo artifacts are not a consequence of low-quality video, but of bad equipment. One of the most common cases is when a complete overlap of views is not achieved, owing to the characteristics of polarizing filters; thus, some light intended for one eye reaches the other and vice versa. This effect is called crosstalk, and it manifests itself as ghosting of frames when viewing stereo. Such artifacts can cause extreme fatigue and headaches, and they can completely turn off viewers. YUVsoft offers its Stereo Ghost Busting plugin for the Foundry Nuke; this plugin can partially subtract the left view of a stereomate from the right view (and vice versa) to compensate for defects in polarization between glasses and the stereo projector. The plugin is easy to use and has a single option, GhostBust power, which determines the percentage of the frame color that is subtracted from the rest view. All processing is realized automatically; the user need only select a suitable GhostBust power value. Input for YUVsoft Stereo Ghost Busting is the source stereomate sequence. 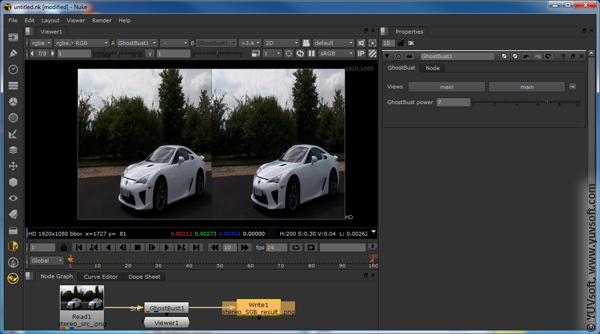 The software then outputs the corrected stereo video sequence. Depth Reader plugin for The Foundry Nuke – converts disparity map video sequences from YUV to RGB for the the correct depth representation. Stereo Correction plugin for The Foundry Nuke.